When I was living in Iran during the Iran/Iraq war in the early 80’s I documented the war and its affect on society in my photographs. After leaving Iran in 1985 my pictures were archived and slowly became a treasure of the past. While in Canada, away from the global turmoil, I felt that I had lost my voice and passion to either document or say anything about local politics or even social events. Everything seemed so foreign to me, and like a good guest, I didn’t want to intrude into the life affairs of the host. That was the turning point where I went back to my arsenal of pictures taken in Iran. In front of me I had a wealth of stories and narrations and no idea what to do with them. As part of an open-project class assignment, I decided to do something with my photographs, and after months of brainstorming and agony I suddenly started to see the images in a different light. Even though individual, the pictures were all related and I saw an urge to present them as a group. The thought of a picturesque mosaic emerged and suddenly I was overwhelmed with so many ideas, as if the flood gates of my inner emotional storms were opened. “History Recalls” turned out to be the result of this sentimental rollercoaster. 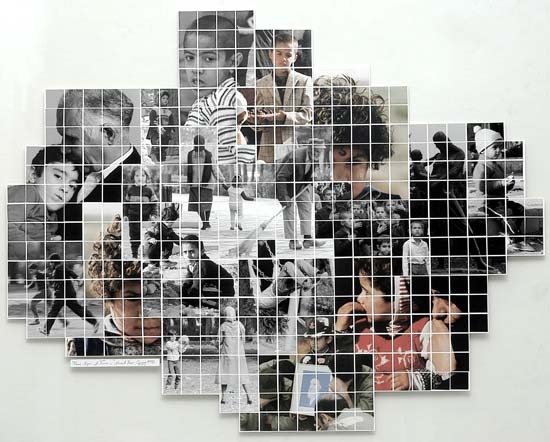 In 1990 “History Recalls” served just as a mere graduation project and not much more, followed by the same fate of the pictures that assembled this unique collage. But this time there was something different. I knew that I now had a jewel that needed to find its special place to be displayed. 5 years passed and “History Recalls” did not move beyond the hook of my living room, but it helped me to nurture the thoughts for a second Mosaic. In 1995 a new piece was created which I named “Once Upon a Time”. Where “History Recalls” was addressing the more immediate pain and suffering of war, “Once Upon a Time” was my reflection upon the affect of war on children. While going through my archives, I realized that I had taken many pictures of children while roaming the cities of Iran during the war. As many years had passed, I couldn’t really remember my emotional reasons or logic for taking those pictures. In order to analyze my thoughts of ten years earlier, I assembled a cardboard wall in front of my bed and attached all my children photographs on it. For about 3 month I would look at them before going to sleep, and would wake up by looking at them in the morning. Suddenly I realized that the common element of all pictures was the absence of happiness and real childhood that you would expect to see in a child’s life. After a process of elimination, the images for the new mosaic where selected and “Once Upon a Time” was created, to find its own place on my living room wall next to “History Recalls”. Another 10 years passed. My mosaics had still gone nowhere and the children of my photographs by now had probably their own family and children.The Iran/Iraq war had for long lost its relevance, or so I thought. In 2005 an opportunity presented itself and after 10 years of coexistence, “History Recalls” and “Once Upon a Time” where displayed publicly for the first time, and for this, side by side. The positive response was enormous and the audience wanted to know whether they had been shown elsewhere as well. When I told them the history, I was overwhelmed with encouragement to show them as much as possible. It now occurred to me that these had become timeless stories and could easily narrate the story of any war and social disaster. Subsequently the siblings where shown at two more exhibits within 7 months. 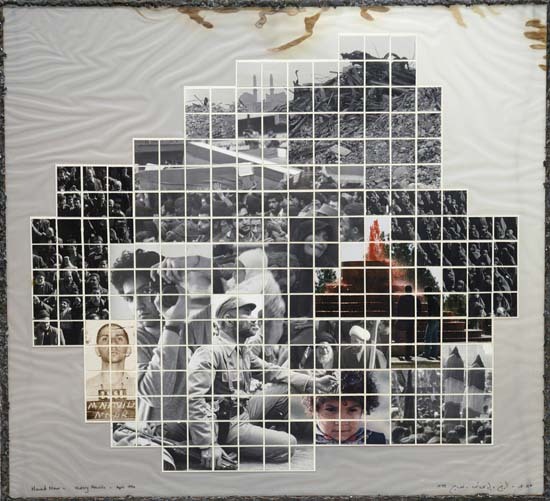 In January of 2007 a first dedicated exhibit with the title of “History recalls” will be displayed at the Curry Student Center Art Gallery at Northeastern University in Boston. While preparing for this exhibit, I thought about the meaning of all this, and came to realize that there are a lot more artist who have feel the same way I do, and who will need a place and forum to express themselves. As of this point, “History Recalls” has evolved into a global movement where all artists who would like to express their dislike of war and oppression can come together, join forces and spread the message throughout the world together. In order to promote this cause, two Iranian/Australian artists and an American/Lebanese artist have been invited to take part in the January exhibit, and the movement is now gaining its own momentum. This website has been created in order to give participating artists additional space and opportunities for expression. The primary goal for “History Recalls” is to find global interest and collaborators who are willing to help to promote this cause and movement. In order to make this an effective and lasting message, the ideology is to refrain using the same elements that will lead to conflict and war. “History Recalls” is a nation of no flags or all flags; a nation of no religion or all religions; a melting pot of all cultures and a place to embrace all that is offered to us as a gesture of friendship. “History Recalls” will be the place where you can offer a hand of friendship to all without the fear of rejection. The driving force behind this collaboration is a positive and constructive force that will attempt to join victims of all sides of conflicts together and by telling their stories create bridges that where destroyed by those who started the war or keep adding fuel to the burning fires. As art is a global language, or a language without boundaries, communication, the mother of remedies for ending a conflict, becomes the strongest force for “History Recalls” to achieve its goal. This tool should be brought to schools, colleges and communities and aid interested artists in collaborating with victims of war to help them in expressing their feelings and let others share these experiences as well. This part of the process will help some to learn from other people’s agony, and will hopefully help the agonized to heal.